Can this mixer and performance pedal route out all of your studio problems? Quality, durability and flexibility meet in a stompbox-format mixer that bridges analogue and digital realms both live and in the studio. High quality analogue audio path with plenty of headroom. USB I/O for great-sounding AD/DA interface and MIDI to boot. Built to live on the road as well as the studio. If it had a headphone amp, it’d be damn near perfect. 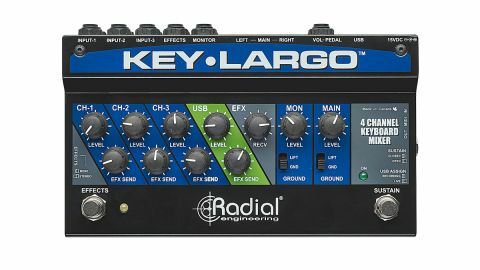 It might seem to have a simple, functional premise, but there’s a lot more going on as you dig down into Radial Engineering’s Key Largo. Aside from the three stereo input channels there’s USB I/O (up to 24 bit/192kHz), MIDI I/O (via USB), stereo FX send/return, separate monitor and mix outputs, volume pedal connectivity and footswitches for effects bypass and sustain (explained below). All of this is delivered in classic Radial style: unfussy, built like a tank, compact and well laid out. The three stereo analogue inputs (left jack = mono/centre pan) offer plenty of gain, so even your most weedy synth can get a hearing. The audio path quality is as high as you’d expect from Radial, and there’s no hint of noise at high gains, except from the source. The channel controls are simple: gain and EFX send level. The send/return amp path is happy with line level FX units and stomp pedals. The stereo mix runs in parallel to Monitor and Main outputs, each with independent level and ground lift controls. Again the signal path is of excellent quality, allowing your keys/synths to blend without any colouration or loss. These are preceded by a stereo volume pedal insert. For performance use, the dual outputs are a boon for those with their own separate monitor rig, which could be a headphone amp as the Key Largo lacks this capability. As a performance tool, the Key Largo is designed for floor as well as desktop use, which is why there are footswitches for EFX return switching and sustain pedal output. The latter allows the player to skip taking a separate sustain pedal and just run a cable from Key Largo to their keyboard, thus keeping the setup ‘localised’. The PSU input is accompanied by a cable clamp to prevent the power loss potential that comes with stage floor situations; it’s the little things that really count! Modern keyboard performance inevitably requires a computer, and the Key Largo’s USB interface presents a stereo input (with EFX send) as the fourth mixer channel, with the summed output available as a recordable stereo input at the laptop/tablet. The USB mode can be switched from ‘Live’ to ‘Recording’ modes so it acts as a normal recording interface. The AD/DA conversion is great and makes the Key Largo something of a one-stop-shop for keyboard musicians, especially with MIDI I/O. Key Largo is a well-thought-out, flexible and high-quality tool for the performing/recording keyboard/synth musician that, besides the lack of headphone monitoring, fills the DAW interface slot on top of integrating a multi-instrument setup. It’s not cheap, but then fitting a mixer and interface of this standard into an easy-to-use and highly durable package never is.